Box's Brolly, Muirhouse's Wolf, Nene Valley's Manhattan Project, Great Newsome's Holderness Dark, Wolf's Granny Wouldn't Like It and Woodforde's Nelson's Revenge were the 6 ales on sale last Wednesday. A couple of days later 2 (or was it 3?) of them had disappeared to be replaced by something else (including one from their own brewery). The beers I tried were better than average and even good but I kept switching as I tried to find euphoria in a glass. I didn't bother with the craft keg offerings as they seemed to be lagers e.g. Redwell Steam, Spitfire (yes, that name confused me too). The pub itself is multi-roomed and welcoming to everyone - drinkers in the quarry-tiled beermat and hop decorated bar, diners in the mezzanined wooden-windowed extension and folk singers in the front parlour. Visited the White Horse for the first time on Friday night. It's a very nice cosy pub with a decent selection of well kept beers. It is well worth a look and I shall be back for another pint or two before too long. Visited this pub with a group of friends on a Friday evening, moored nearby at the free dock. What a night! Good, honest food at a reasonable price, followed by an evening drinking with the locals, very friendly and good fun. The best pub i have visited on the broads, old fashioned local that does what it says on the tin! Well worth a visit. Visited twice last Sunday, for a Roast at lunchtime and for a drink in the evening. The roast was excellent and as we had two, super value at �12 for 2. As moored close by - came back for a drink in the evening. 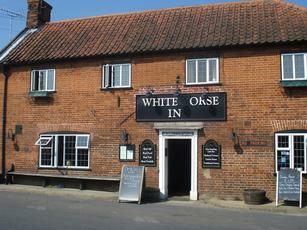 A traditional country pub that serves the local community as well as the holidaymakers on the Broads. Friendly staff, friendly locals, super pub and a bit of a labyrinth inside. A nice change from the usual generic open plan boozer.